As you can see, one of the featured dishes is based on Nutraloaf, a deliberately disgusting meal served to inmates as a form of punishment. Nutraloaf is exceedingly controversial, and some prison reform advocates have argued that it’s a form of torture. Viewed by many Americans as cruel prison punishment, Nutraloaf is made up of a three-course meal blended together into a paste, then baked into a loaf. Doesn’t sound or look too appetising, but rest assured, your taste buds are in good hands. This might seem like a rogue bad idea, except that it appears to be an actual partnership with Netflix. 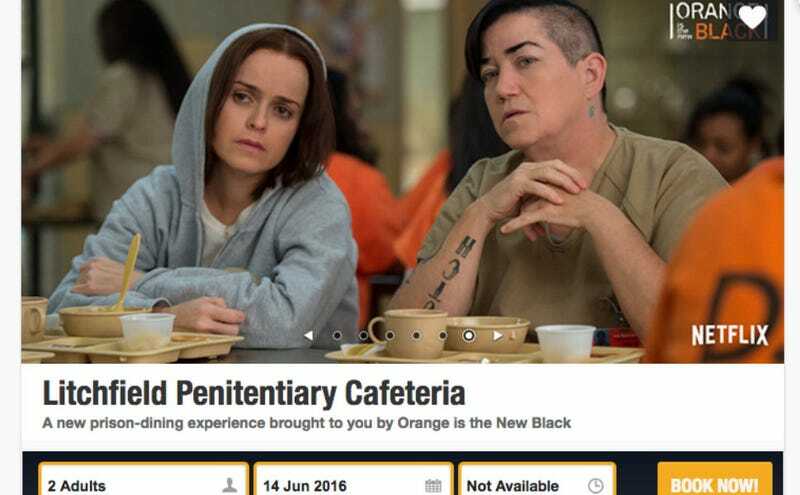 The Chope page claims the event is “brought to you by Orange Is the New Black.” A video promoting the pop-up was posted by Netflix; it features Lea DeLaria, the actress who plays Big Boo. Singapore, like the United States, is very good at locking people up: the country has some of the most draconian drug laws in the world, including both caning and a mandatory death sentence for some drug offenses. Jezebel contacted Piper Kerman for comment via Twitter; she was unaware of the promotion. We have contacted Netflix for comment and will update when we hear back.